C. Christopher Smith and John Pattison, authors of the award-winning, highly-reviewed book, “Slow Church,” will appear at First Christian Church, 650 McCallie Avenue, on Sunday, July 10 at 7:00 p.m. The event is free, open to the public, and accessible to those with hearing loss. A small reception will follow the conversation. “’Slow church’ is, on one level, a call to unmask and repent our industrialized and fast-food approaches to church, which tend to emphasize quantity over quality, programs over people, the church sanctuary over the neighborhood, control over empowerment, and predictability over risk and beauty and wonder,” states John Pattison. “The key to this deeper life is cultivating attentiveness to the vast diversity of gifts that God has given us,” adds C. Christopher Smith. In today’s fast-paced world, Pattison and Smith encourage churches to slow down to avoid the so-called collateral damage that comes from speed. 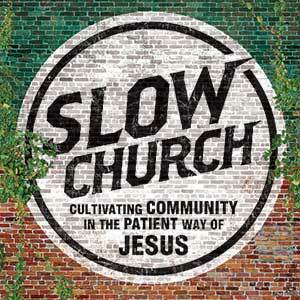 Slow Church follows in the footsteps of other slow movements. Inspired by the slow food movement of the 1980s, Smith says that slow church calls churches to a deeper life together in the local community, to be boldly committed to their neighborhoods. “Our congregation recently finished up a congregational study and sermon series focusing on Slow Church,” shares Senior Minister of First Christian Church, Rev. Brandon Gilvin. “Being engaging and informal speakers, we hope the message that John and Chris bring will serve as an important conversation starter for churches longing to sculpt a more authentic sense of community and a deeper emphasis on quality of relationship with God,” adds Gilvin. Located at 650 McCallie Avenue, across from UTC, all are welcome at First Christian Church, a church of service, working for wholeness in a broken world. Email Rev. Brandon Gilvin at brandon@firstchristian-chat.com or call 423-267-4506 for more information.